The thing I love about acting is, whatever character you play, it gives you the chance to expose another side of yourself that maybe you’ve never felt comfortable with, or never knew about. Not that every character is you, but there are underlying emotions that everybody has. 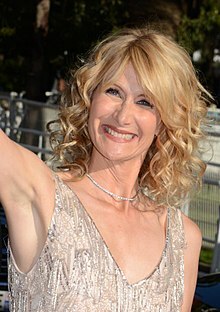 Laura Elizabeth Dern (born 10 February 1967) is an American actress and activist. A recipient of several accolades, including four Golden Globe Awards and a Primetime Emmy Award, she is known for her frequent collaboration with director David Lynch in several films and television series. She is the daughter of actors Bruce Dern and Diane Ladd. With the technology, we’ve become more apathetic, because we don’t look in each other’s eyes any more as we attempt communication. But at the same time, with one iPhone, we can start a revolution. I like to be a little bit of a rebel as an actor. I will cherish this as a reminder of the extraordinary, incredible outpouring of people who demanded their voice be heard in this last election so we can look forward to amazing change in this country. I have never had an experience (like 'Star Wars'), and that includes 'Jurassic Park,' of what it feels like to be a character to young children that feels otherworldly or iconic or whatever that is. So now, I've had this amazing experience of little kids seeing me and instead of wanting to talk about the movie, they kind of back away, a little scared. It's like when you go to Disneyland and see Mickey Mouse and you're little. It's a weird thing that 'Star Wars' holds something a bit untouchable or something like that. With the technology, we’ve become more apathetic, because we don’t look in each other’s eyes any more as we attempt communication. But at the same time, with one iPhone, we can start a revolution. If there’s injustice, you just film it and post it. And suddenly people are tapped into a current event they wouldn’t otherwise see, and that’s incredible. I could have never done it if David [Lynch] wasn’t a friend. He was very protective of me, like a big brother—he always has been. When it comes to Wild at Heart, if we had a love scene, everyone was very respectful… There’s no getting it wrong. Daring to go too extreme or too subtle or too anything—he requires it all of you and it’s all such fun and there’s no judgment on a set with David—ever. Except when I bring bottles of water on a set; he hates that. Many of us were taught not to tattle. It was a culture of silencing and that was normalized. I urge all of us to not only support survivors and bystanders, who are brave enough to tell their truth, but to promote restorative justice. May we also please protect and employ them. May we teach our children that speaking out without the fear of retribution, is our culture’s new North Star. I never had a misunderstanding of what [acting] was about. Unfortunately, overall, movies are a conglomerate. People buy and sell people in this business, which can get really ugly unless you have the right set of values and understand why you’re doing it. Luckily, I was raised by people who’d already gotten to that point, and seen all the yuck stuff—which is probably why they originally didn’t want me to act. I also understood the difference between getting a part at a Hollywood party and really getting a job. I knew you had to go in and audition and maybe then they’d hire you, and that’s where you start. I also had a good understating about press: that it’s the actor’s responsibility to publicize his or her films, that the press can be fun, that it’s not about hyping yourself into stardom or trying to sell yourself as a hot ticket. The thing I love about acting is, whatever character you play, it gives you the chance to expose another side of yourself that maybe you’ve never felt comfortable with, or never knew about. Not that every character is you, but there are underlying emotions that everybody has. I feel that movies are gifts that come to you, and there are no accidents in what you end up doing. I study Jung, who talks a lot about the shadow side, the repressed side. I like to be a little bit of a rebel as an actor, so I am interested in the unpopular person and the lesser-understood character. It's a bold choice to try to find empathy in an unlikeable place in storytelling. I think the film is so interesting because I have never had an outpouring like this in my entire life as an actor. We shift stories in our own lives to be able to survive them, about our own family and whatever traumas we have walked through, to make them somehow palatable. And somehow, in adulthood, it's like we have to relive those stories in order to find healing in them. On the message of the 2018 drama film "The Tale". Her ability to create characters who have both humor and deep emotional impact is unparalleled. On Dern's portrayal in the 2017 television series "Big Little Lies"
This page was last edited on 16 July 2018, at 20:26.